Here is a taste of Obama’s “Back to the Future” cabinet. For those of you who voted for him with the hope that the US would soon become a North American Sweden— you were wrong and we told you so. I just didn’t think it would only take two weeks to become clear. I guess Barack doesn’t want anyone to get the wrong idea about him being a “progressive” or something so he stocked his cabinet with rightist retreads. And here I was worried that the new administration would be difficult to oppose with the kind of vehemence I usually oppose bourgeois governance. Lucky me. Timothy Geithner, president of the New York Federal Reserve Bank for Federal Reserve. He never met a bank he didn’t want to take home like a little lost puppy and nurse back to health. If you own a bank, you’re in good hands. Lawrence Summers former Treasury Secretary of the Clinton administration to lead the “economic team”. Meaning the guy who pushed deregulation wholesale will reregulate? I suppose the best person to clean something up is the one who made the mess. Wait, I think that only works with kids and toys. I’ll ask my mom (an Obama supporter) and get back to you. For Secretary of State, Hillary Clinton. The Senator from New York (well not really from New York), married to one William J. Clinton and lambasted in the campaign by Obama on her hawkish foreign policy. She has plans, long term plans of which she plays the starring role. A real good friend to the Zionists (a trait common to the cabinet-in-waiting) she shares their primal fear of uppity Iranians. Since she already knows how to dodge bullets I suggest the border region of Pakistan as her first assignment. Commerce Secretary Bill Richardson, former United Nations ambassador and energy secretary during President Bill Clinton’s administration. Richardson is a tool, I can’t think of anything to say about the guy. He is just such a wonk. I think he thought he might get State, which he has been angling for all of his life. If Hillary’s ego should make it impossible for her and Obama to be in the same room the sycophant Richardson may bat clean up. By the way, I understand that the White House walls are being removed between rooms. Apparently more space is needed to fit the inflated egos of Obama’s new cabinet. Like two people walking with open umbrellas Obama and Clinton have to stay a clear five feet from each other at all times lest their huge heads collide. Health and Human Services goes to Tom Daschle, longtime leader of the Senate Dems. Daschle is also tool though apparently he was so liberal (as Obama’s defenders are apt to point out) that the good people of South Dakota wouldn’t have him. And what was the main reason he lost? Certainly not abortion where NARAL gave the Democratic leader a miserable score of 50 out of 100. Since his loss he has made himself busy as a “Senior Policy Adviser” with the law firm Alston & Bird whose interests include CVS Caremark, the National Association for Home Care and Hospice, Abbott Laboratories and HealthSouth to the tune of about a million a year. All these companies are firm supporters of national health care…in fact, they are going to expropriate themselves. National Security Adviser goes to Marine General James Jones (we’ll call him Jim Jones), former NATO commander and board member of Chevron and Boeing. He is a “Middle East Expert” apparently. I guess that means he knows where the oil (and bodies) are buried (or to be buried). Eric Holder for Attorney General, former Justice Department official under the Clinton Administration and legal aid to Colombian oligarchs and the good folks of Chiquita accused of killing trade unionists. Obama “made points” in the debates over the Colombian Free Trade Act. I guess he must not have consulted Holder before hand. Now he’ll get the chance. Roll on Colombia, roll on. For Homeland Security wall-happy, loather of immigrants and Governor of Arizona Janet Napolitano who has been instrumental in militarizing the border placing the National Guard there. She has been a big proponent of a crackdown to keep out our southern neighbors’ Tired, Poor and Hungry. Her next act? Only full citizens can visit the Statue of Liberty (unless you’re there to mop the floors). Defense goes to a Bushie with current Defense Secretary Robert Gates staying on for a while possibly to be followed by Chuck Hagel, Republican Senator from Nebraska. Clinton gave Defense to the Republicans as well with Bill Cohen stepping in to prove that, when it comes to foreign affairs, the country “stands together”. Wait, didn’t Obama campaign on being opposed to the way the military was being utilized? I guess there is no firmer opposition than appropriation. I just made that up but Barack, if you are listening, you can use it. My comrade and I hit the road on Friday for Lexington, Kentucky on the spur of the moment. Bonnie “Prince” Billy and the Picket Line were playing a benefit for the Eastern Hemlock (the Grand Dame of indigenous trees) which has recently suffered from an invasive insect. Will Oldham shows are often more events than concerts and the 5 1/2 hour drive was seen as no barrier and was made quicker by good music and conversation. The conversation, not surprisingly, focused on capital’s homogenization of the landscape as evidenced by the entire ride down the highway. I’ll leave a review of the show to others. Needless to say the sound system was also suffering from some sort of blight, but the Bonnie Prince and band did their best to salvage a set including a haunting rendition of Sam Cooke’s “A Change is Gonna Come”. Once we got across the Ohio River and the Mason Dixon Line we tooled the back roads into Lexington on a cold day. Once we passed the final outer ‘burbs of Cincinnati the landscape changed to rolling horse farms. Mile after mile of old stone “slave fences” (rough, unmortared field stone not necessarily, but sometimes, made by slaves) and beautiful black wood fences lined our way. The sun creating brilliant shadows through the slats across the road. I am used to seeing Kentucky as a somewhat deprived state, and in many ways it is. How many times have I seen Harlan County, USA? Not so in these parts. All the world’s super-rich so inclined to equestrian pursuits have a horse farm in Central Kentucky It seems rich people just dig horses. Or maybe it helps them act out some sort of feudal fantasy. Just like the spreads of millionaires who retire to cowboy fantasies on ranches out West these compounds looked more like country clubs than working farms. Everyone who’s anyone, from the Sultan of Brunei to Queen of England, have a spot. The miles of dry fence hewn from the field stones of cleared land perfectly hugged the road giving the landscape an idealized New England feel. In between these two meals a frightening amount of McDonald’s cheese burgers were had leaving an intense feeling of distress on our systems for the return drive. Good to get out of town after a hard week at the coal face. Reminder to self: next time bring the camera and a bag of apples and homemade granola forgoing road food entirely. Thanks to my buddy for doing the heavy lifting and to Will Oldham for, yet again, providing a damned good reason to get out of town. And now back to work. Photo from Backseat Sandbar which also has a review of the show. There has been, quite correctly, a lot of talk among Marxists these days of crisis theory. In this audio file of a speech given last week David Harvey takes a look at how capitalism attempts to resolve its crises. His talk, The Enigma of Capital, raises a bunch of issues for us. Apologies for the “filler”; school and work beckon this week. A little musical interlude while I claw my way from under a mountain of school work. An electric guitar in the hands of Neil Young and backed by Crazy Horse. A fearsome thing to behold…..
A creative couple of videos on the dynamics of commodity production and consumption. The analysis here is proof yet again that the method of Marx, compared with all of the other attempts at explaining our world, is far superior. With all that is happening no wonder we can’t get on the television and they give Paul Krugman a Nobel Prize. Supply and demand? Pshaw. To know is to be armed. More of these sketches of capitalist economy with names like Felix the Cat and Capitalist Competition and The Matrix and Machines can be found at Brendan Cooney’s Kapitalism 101. This discussion needs to be constantly happening and, at least for my generation, it hasn’t. Hats off to Kapitalism 101 for helping to break that poor tradition. These are my heroes. A few years back I took a bike ride through Ypsilanti’s Highland Cemetery. I had heard that there was a monument to Civil War soldiers, it was a nice day and I ended up there more as a destination for a ride rather than as a destination in of itself. I got to the monument pictured above and read on its base “They Died To Make Our Country Free”. What a remarkable thing I thought. It didn’t say to restore the Union or to make or country freer, or to live up to its constitution (which itself helped to codify slavery), or anything like that. It said to make free, meaning it was unfree. Not a popular thing to say, even today, when we would like to think that slavery was endorsed only by the Southern states rather than by the whole of the Federal Government. 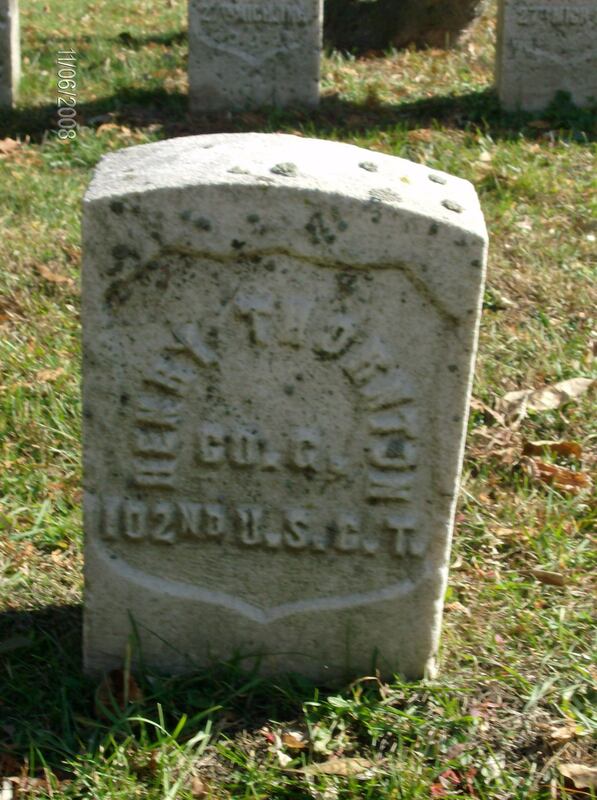 I looked around at the graves and noticed some with the marking “102 USCT”. I knew that meant “United States Colored Troops”, but more than that I did not know. Also remarkable, they were buried among the white veterans on the Civil and other wars. What was the 102 USCT? Why were they buried here under this statue among other, white, soldiers. Above all, who were these men? So began an investigation, perhaps an obsession, into the black men of Ypsilanti who would join in, what they surely viewed as, a war of liberation to destroy slavery and free their people. Since then I have spent untold hours in archives, deeds offices, newspaper stacks, libraries and searching the streets to see if any of their homes still stand. Whatever tangible connection I could find to them. Over 70 black men from Ypsilanti, or around 80% of the listed adult male black population (which was surely higher than recorded), would join after the army was opened up to blacks in the Spring of 1863 (Louisiana, Missouri and South Carolina had earlier, local, recruitments). Almost all of them the First Michigan Colored Infantry, later 102nd United States Colored Troops. Around twelve men, impatient with the lack of progress in raising a regiment in Michigan, joined the first regiments in the country to be raised: the deservedly famous 54th and 55th Massachusetts Volunteer Infantry. Massachusetts, the seat of abolitionism with a Radical Governor, refused to add “colored” to the name of the regiment. These men would see and endure the unimaginable. Including two who would be sent to the dreadful Andersonville Prison, one of whom, Charles August, would die there. The heroic, but doomed assault on Fort Wagner was the defining public moment for black participation in the war. Men who lived not three blocks from me would storm its parapets only to be driven back with huge losses. There is so much more to say on who these men were, where they came from and what it says about how some blacks viewed the war. For me it has been a window onto world I had heard of, but could never really define. Now I see it, if not clearly, than in more detail than I thought possible. My curiosity has been peaked and I don’t know how to stop. Any one who knows me, often to their annoyance, knows it can be my favored topic of conversation. I would like to rescue these men from the obscurity racism pushed them into, from the obscurity of time and class as well. They deserve to be known, to be understood. They are a vital, vibrant link in the revolutionary tradition of the United States. They are genuine heroes; soldiers of black, of human, liberation. I went to Highland again last Thursday. A perfect late fall day. The leaves have peaked and everywhere among the trees a golden snow was falling. 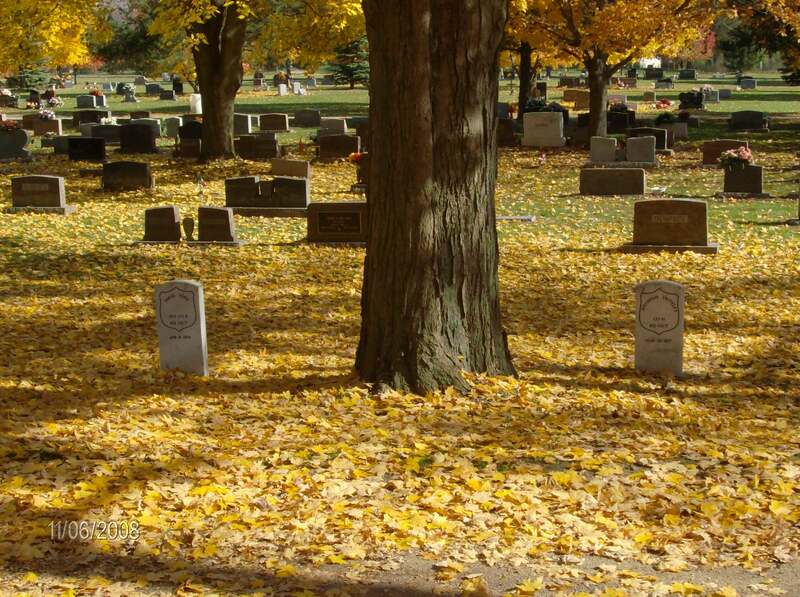 A quiet day in the cemetery after the tumult of the election’s final week. I found myself wishing I could have told them that on Tuesday the United States elected a black President. I wonder what they would have said. 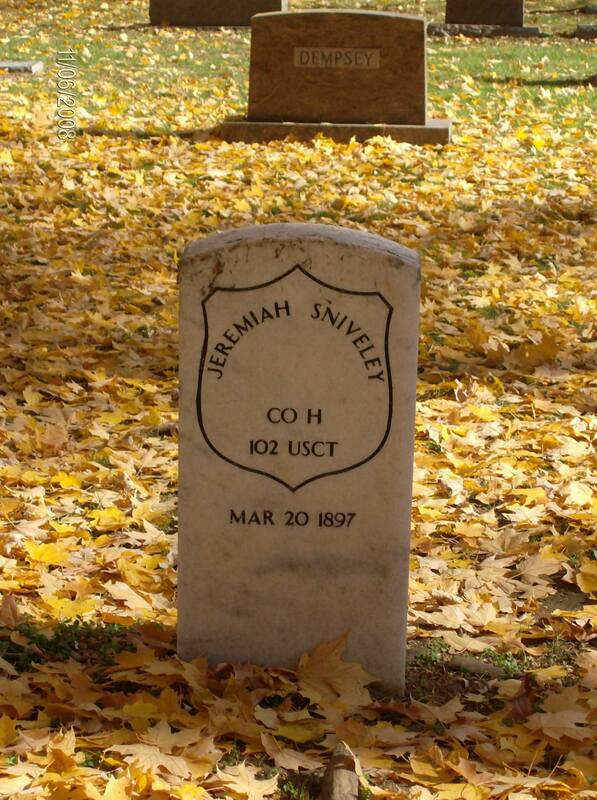 Jeremiah Snively joined the Regiment at the age of 19 in January, 1864. He lived in Ypsilanti after, working as a day laborer. His grave marker is one of several new markers bought by a kind individual to replace the deteriorated originals. 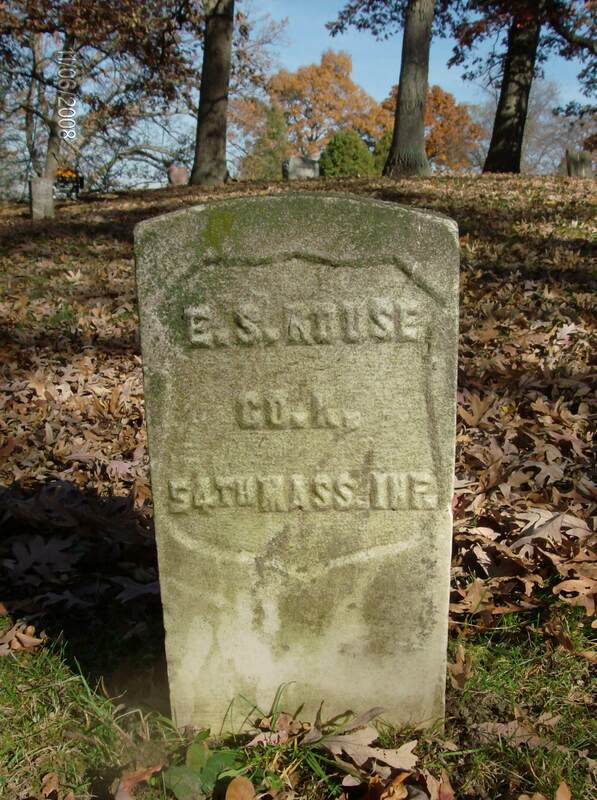 Elias Rouse most probably came from a slave family in Kentucky, listed as a mulatto, he may have been the child of his mother’s Master or one of his children. What I know about his early life is sketchy. He would end up in Chatham, Ontario which along with Buxton was a center for runaway slaves, free blacks who could no longer abide the racism in the “free states” and radical black abolitionists organizing to strike a blow against slavery. It was in Chatham that John Brown met with people like Martin Delaney and John De Baptiste (who would go on to lead recruitment to the 102nd) hoping to win support in the colony of exiles for his armed foray into the South. Elias would then end up in Ypsilanti where, with William Scott, he would leave for Massachusetts to join Company K of the 54th Massachusetts in May, 1863. Meaning as soon as he was able to join a regiment he went. He had, perhaps, been waiting for that day all of his life. 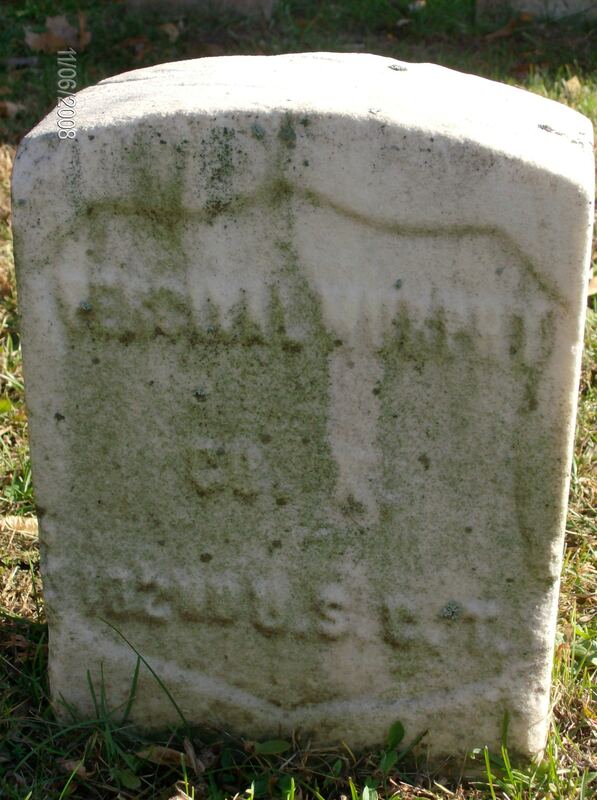 Elias was wounded in the assault on Fort Wagner but stayed with the “Glory” Regiment through its entire service. William Scott would, like so many others, fall ill and was discharged within six months of joining. Many more members of the 102 and other black regiments died of disease than of combat. Elias returned to Ypsilanti after the war where he would marry the widow of his comade John Gay of the 102 USCT, Mary Gay. 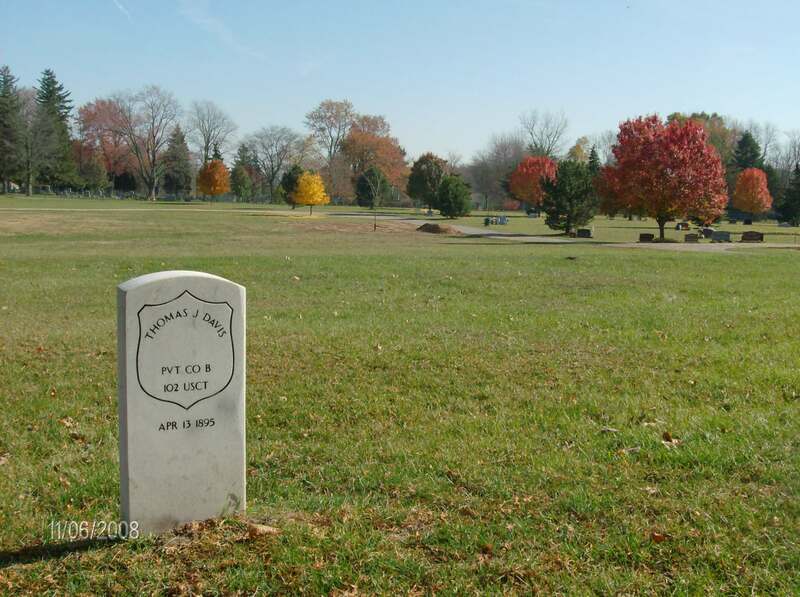 The Ypsilanti men who had gone to join the 54th and 55th would see their Ypsilanti friends of the 102 later in the war. All these Regiments were stationed together in Florida and South Carolina at one time or another. They would fight together at Deveaux Kneck, Boykon’s Landing and Honey Hill there. Several raids would destroy hundreds of miles of Confederate rail and infrastructure. John Gay died of disease in South Carolina in 1865. He is buried there. Elias would raise John’s children with Mary and they would have some of their own. He died in 1899, and is listed in the records as a peddler and day laborer. His house with Mary still stands, she may have bought it with her Widow’s Pension in the 1870’s. I would love to know more about Elias and will continue to try to track down what I might about him. To see a photograph of him, to see his face, would be a deeply satisfying thrill. Comrades in life and in death. Henry Thornton is mostly a mystery. I know he joined the Regiment later, in October 1864, at the age of 38. But other than that I don’t know much about him. 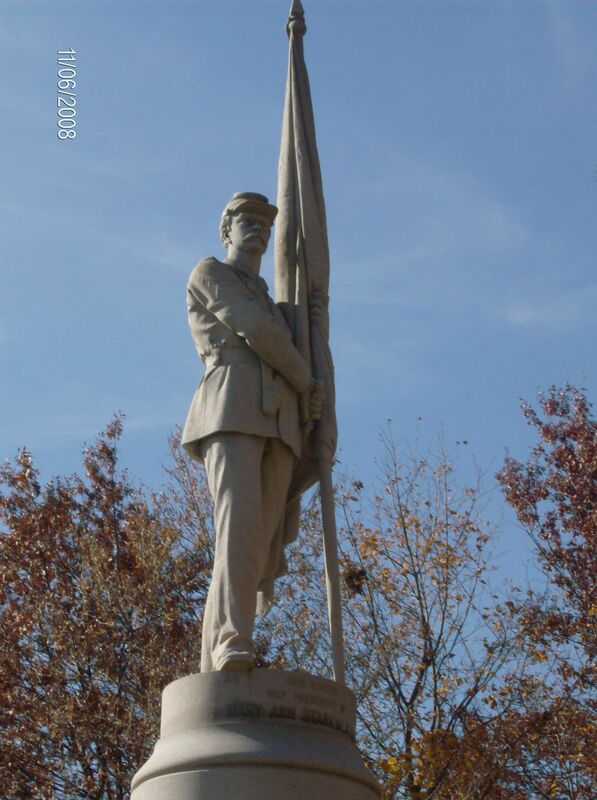 This is a Grand Army of the Republic marker from the time of his death. He would probably have been a member. There were two black GAR branches in Michigan, one of them named after John Brown. Either this is David York’s grave with his brother George York’s death date or it is George’s grave with David’s name on it. Both had come to Ypsilanti with their family from Kentucky in the 1850’s. George enlisted at the age of 15 with his 18 year old brother David in October 1863. George fell ill and died tragically without ever leaving Ypsilanti. David would return to Ypsilanti where he married a women named Mary, have half a dozen children and lived a couple of blocks from where I live now. A laborer he died after the turn of the century. 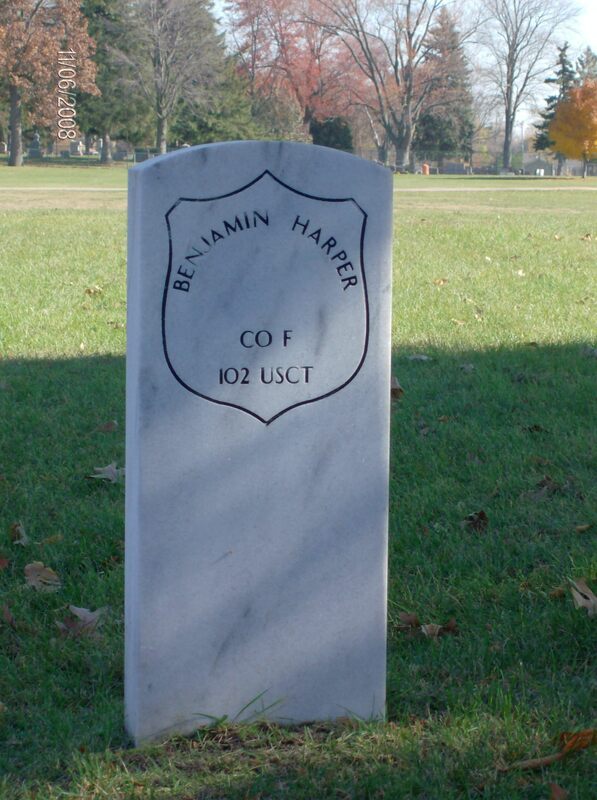 Benjamin Harper, originally from Indiana joined the Regiment in November, 1863 at the age of 20 and served the life of the unit. He saw battle in Florida and participated in raids into the Carolina interior that destroyed plantations, skirmished with Confederates and liberated slaves. His comrade of the same company was Jesse Oliver from Ypsilanti. He would die of wounds received at the Battle of Honey Hill. After the war Benjamin would live next to the Yorks and marry a woman named Martha from Canada. He would die around the turn of the century. Percival Murphy joined the Regiment at the age of 39 in February, 1864. Originally from Ohio he is listed as “mulatto”. Percival had come to Ypsilanti some years before the war. The town had for many years, since the Second Great Revival, had a reputation as relatively tolerant. Its proximity to Canada would mean that it would also be a way stop for black folks on their journey to that, more hospitable, country. Many young black men show up on the records before the war as single farm laborers boarding on white farmsteads. Percival also lived not far from me where he raised a family with his wife Catherine, originally from Delaware. 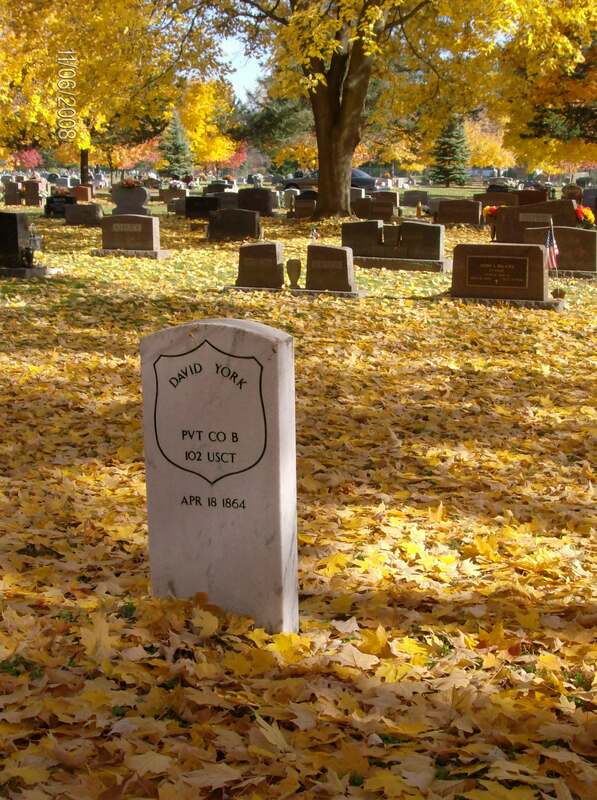 Thomas Davis joined at the ripe old age of 44 near the end of the war. Originally from Virginia he had also come to Ypsilanti some years before the war where he worked on farms with his brother Daniel. He would marry Margaret who would die young. He would later marry Elizabeth and work as a peddler. He died on April 13, 1895. There are many more names and stories to share. These are just a few of the men who would join the freedom struggle from Ypsilanti. Others, like William Casey and Edmund Lowe, would become leaders of their community. Many more came home from victory to the harsh reality of an unfinished revolution; continued racial discrimination and violence and the exploitation inherent to their class. All of them deserve mention. Surely, none were angels and just as surely very few of us will ever do more for freedom than they. Lev Davidovich, This is Your Day! Today is the 129th birthday of the 20th Century’s most determined revolutionary. Leon Trotsky helped to turn the world upside down, or rather right side up. The ruling class often attempts to derogate their enemies by making them kitsch. What they don’t get scares them so they, bully-like, belittle. And how could they ever get a person of the imagination and conviction of Lev Davidovich? 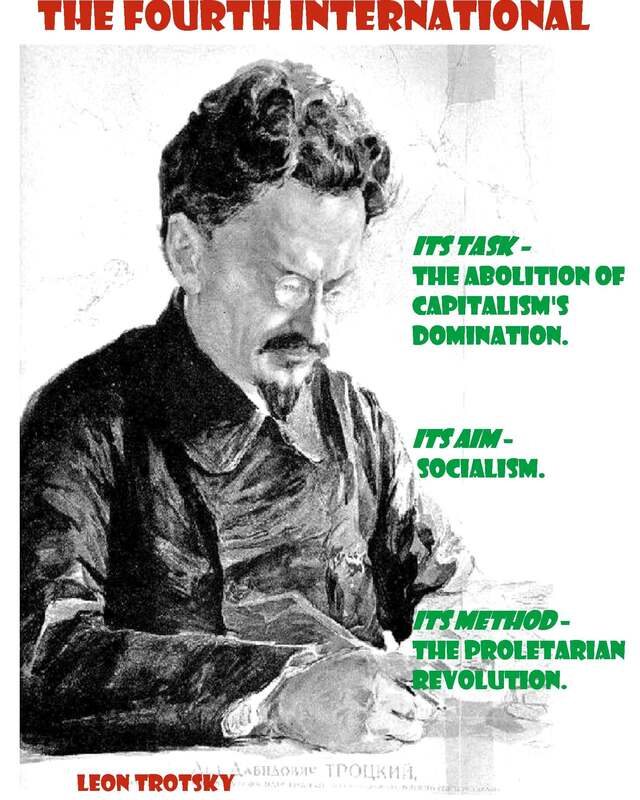 There is nothing kitschy about the real Trotsky. As a man deeply involved in the struggles of his time; wars, revolutions and counter-revolutions, Trotsky, along with all those revolutionaries who have come before us, helped shaped his present and ours and continues to struggle along side of us today and tomorrow. A deep bow of respect and the greatest gratitude.